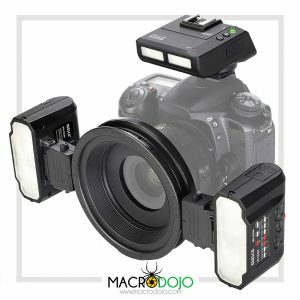 Ultraviolet (UV) macro photography is a highly niche and challenging photography genre, largely because of the difficulty in finding a suitable subject, in getting the subject to be cooperative, and to get the exposure just right. 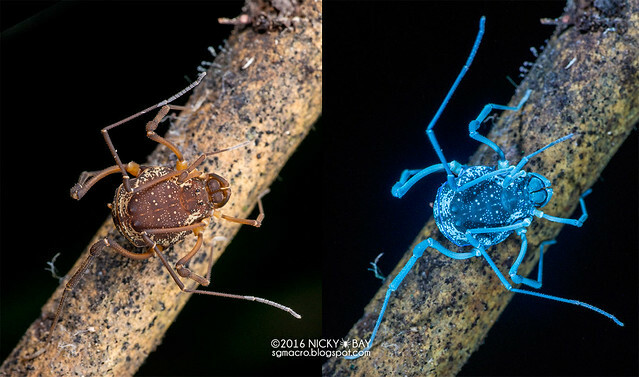 Most examples of UV fluorescence in the world of arthropods had been restricted to scorpions until in recent years when I saw some examples of UV fluorescence in harvestmen by Paul Bertner. 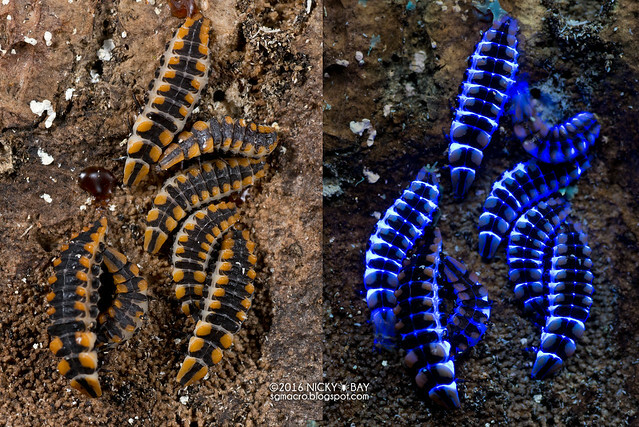 Since then, my group of photography buddies have been experimenting with UV exposures during our field trips and managed to land some pretty alien, mind-blowing results! 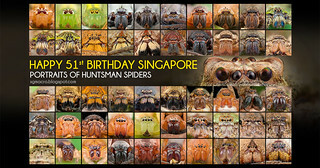 Most of the photographs were taken in Singapore unless otherwise specified. Thanks to my friends who have been constantly trying out UV on the various subjects that we found, especially Melvyn and Chris. Thanks to Javed Ahmed for valuable inputs in each of the posts that I write. Without them, this series would have been way less interesting! 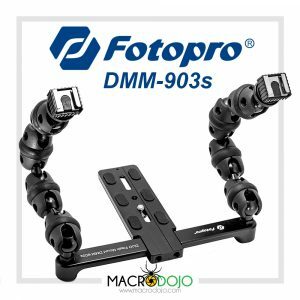 I have been receiving many questions about the equipment used for the UV photos and thought it would be better to answer them here. UV fluorescence is not UV light, so the presence of a UV filter does not affect the photo. The fluorescence is visible to the naked eye so all you need is a UV emitting light. I am using many different models of UV lights, many of which are brandless and from China. Most give varying results even within the same model, so I am unable to recommend any "best" one. For a start, try UV lights with a shorter wavelength in the range of 365nm and experiment from there. If you do attempt UV fluorescence photography, please read the warnings regarding use of UV lights below. Prolonged exposure to certain wavelengths of ultraviolet can be dangerous to human skin and eyes, and possibly to some subjects as well. Please be aware of the risks involved before working with various ultraviolet wavelengths, and avoid using extended exposures. Just added a video showcasing some of the bizarre ultraviolet fluorescence examples. 4K resolution available, so watch in full screen for the best experience! 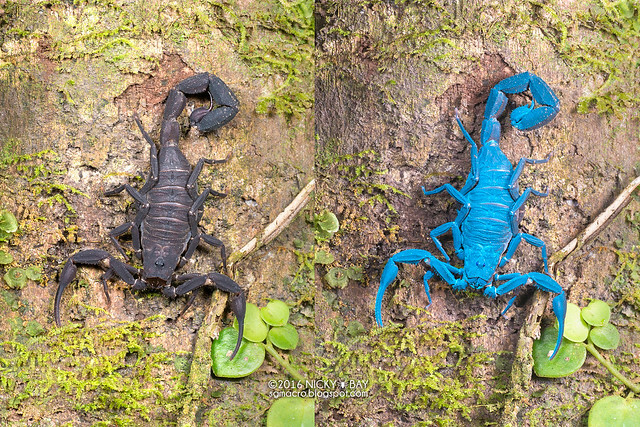 Ultraviolet light has been used for spotting scorpions for a long time, as they fluoresce brightly under ultraviolet and can be spotted easily from a distance. Your first sighting of the fluorescence would almost definitely be mind-blowing as they would appear to be glowing brightly in the dark! Over time and experimentation, we found that several harvestmen would produce a faint fluorescence as well, and on various parts of its body for some. This is a less common example where the entire body fluoresces. 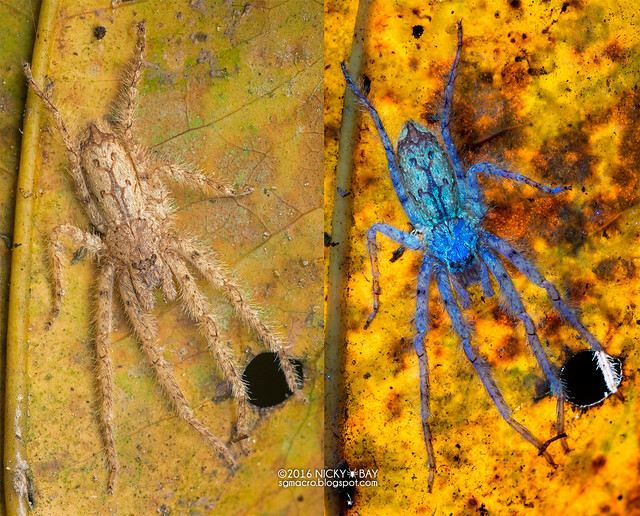 One of the first few spiders exhibiting ultraviolet fluorescence was this cryptic Caerostris. It wraps itself onto tree branches in the day, blending in perfectly. 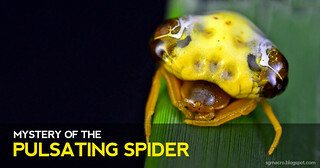 The ultraviolet fluorescence here exposes the spider while leaving the branch in its natural colour. 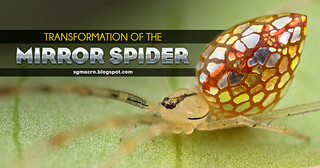 The abdomen of Gasteracantha exhibits a strong fluorescence in the sclerotised areas, leaving its muscular depressions in its natural dark colour. This allows us to view the distribution of muscular depressions easily. Looking like a piece of dung, this spider transforms into a beautiful blue jewel under ultraviolet, exposing the locations of the muscular depressions on the abdomen as well. Some huntsman spiders have a moderate fluorescence that is stronger in the legs and carapace and occasionally on the abdomen as well. 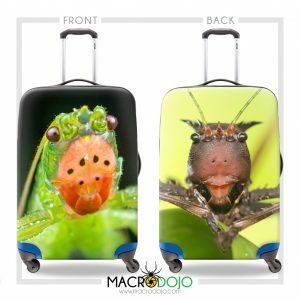 The camouflage is also easily exposed in the example. 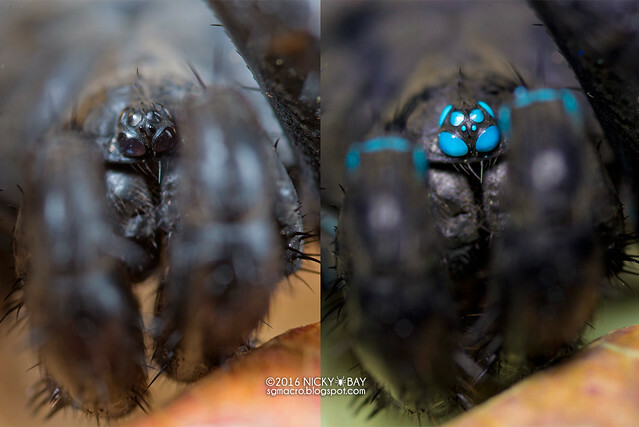 While most spider eyes are really small, their eyes almost always fluoresce. 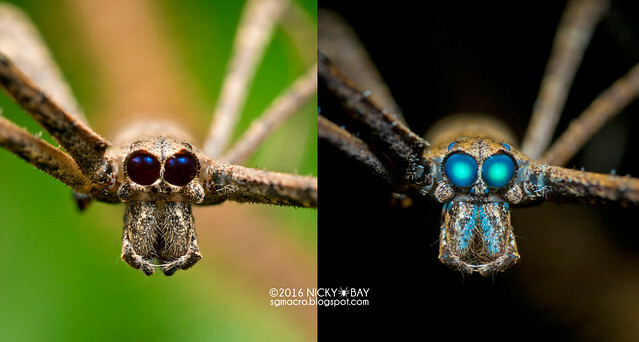 The ogre-face spider has exceptionally large anterior median eyes that are ideal for showcasing this fluorescence. It almost looks creepy! 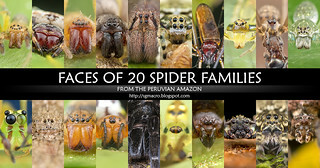 Some spiders are completely black and it can be extremely difficult to discern the location of its eyes. 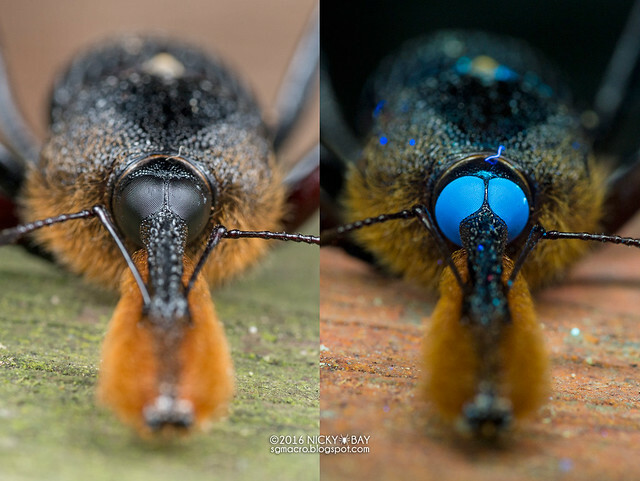 Ultraviolet reveals the radical eye positions clearly in this male Liphistius from Malaysia. 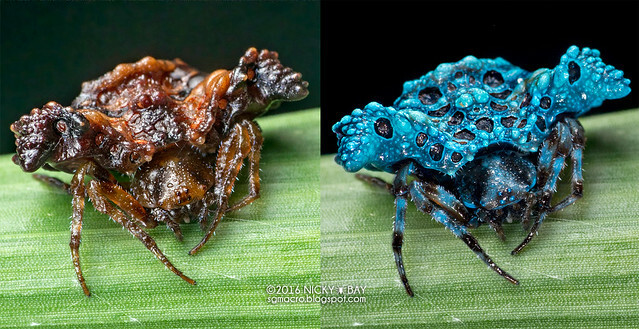 Many crab spiders exhibit a fairly bright fluorescence under ultraviolet, especially those that ambush in or close to flowers. Some flowers are known to fluoresce with various hidden patterns under ultraviolet, so there might just be a logical link between the two! 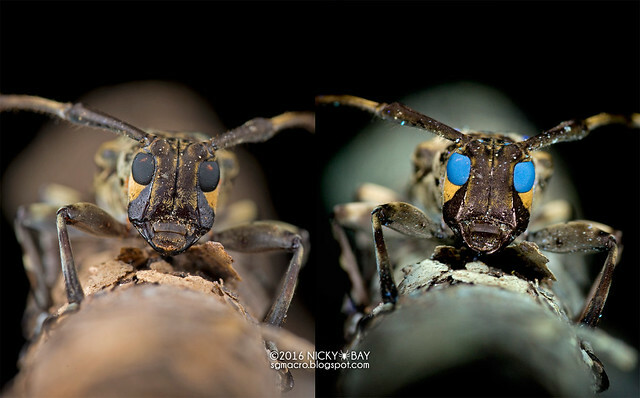 Beetle eyes tend to show a faint glow under ultraviolet, and is easily shown in cerambycids with large compound eyes. 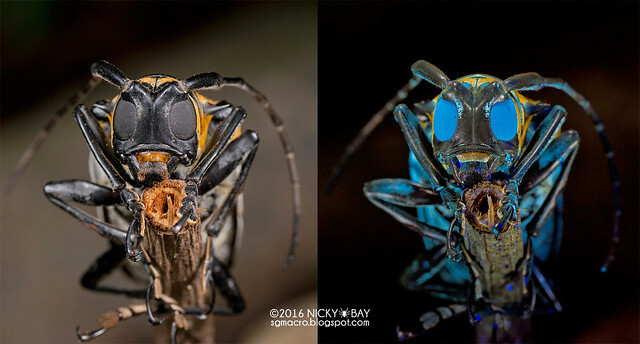 Another cerambycid with part of its abdomen fluorescing lightly as well. This funky and large weevil from Belize is a good example to show others exactly where the eyes are positioned and how it is not "just a ball of eyes" with a snout sticking out. 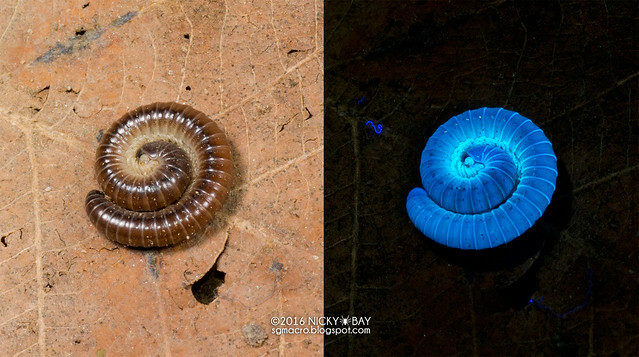 A small number of millipedes can fluoresce brightly under ultraviolet, with the legs showing the brightest fluorescence. I have not determined the species that do fluoresce, but the brightness can be comparable to that of scorpions. 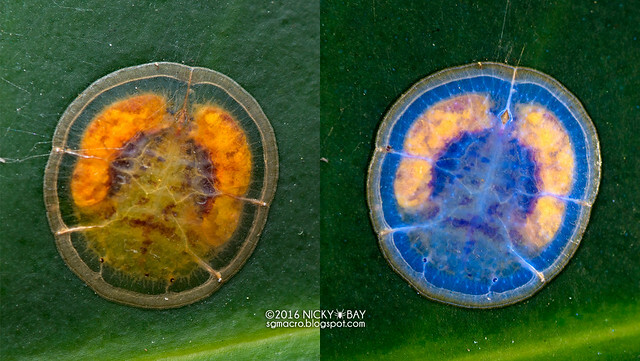 A good number of lepidopteran larvae show varying degrees of ultraviolet fluorescence. With some trial and error, we found some pretty amazing looking fluorescence in this spiky fellow! This patch of lycid larvae was a surprise find, with fluorescence turning the scene into what looked like a water painting. 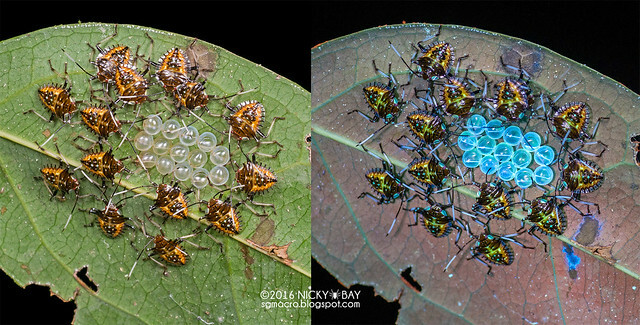 Pentatomid eggs fluoresce well under ultraviolet as well. 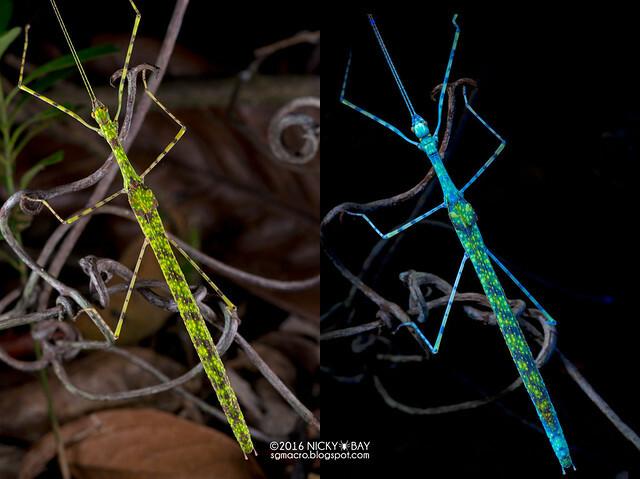 Sometimes, the nymphs will display varying degrees of fluorescence as seen in this example from Peru. 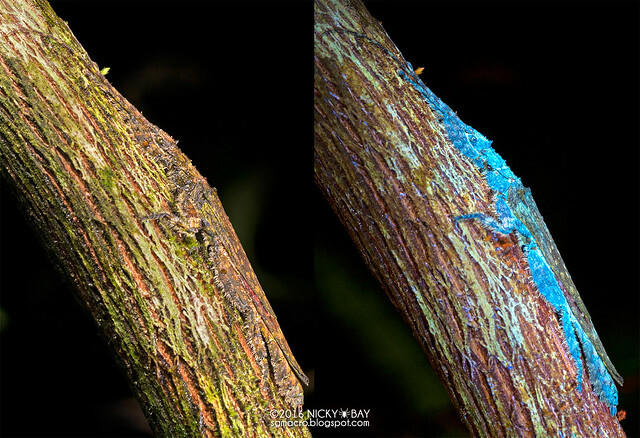 In Belize, we found a cryptic stick insect that blended exceptionally well into its surroundings, and discovered that the camouflage failed beautifully under ultraviolet! This tiny scale insect spells alien when viewed under ultraviolet. 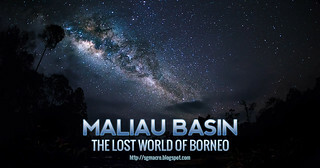 Completely out of this world! This leaf-mimic katydid flattens itself on a leaf to conceal its silhouette, but exhibits a venous fluorescence. 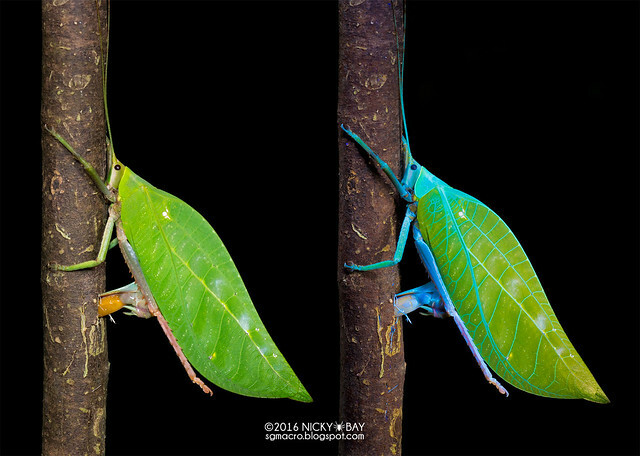 The fascinating venation of this ovipositing leaf-mimic katydid is easily highlighted with ultraviolet. 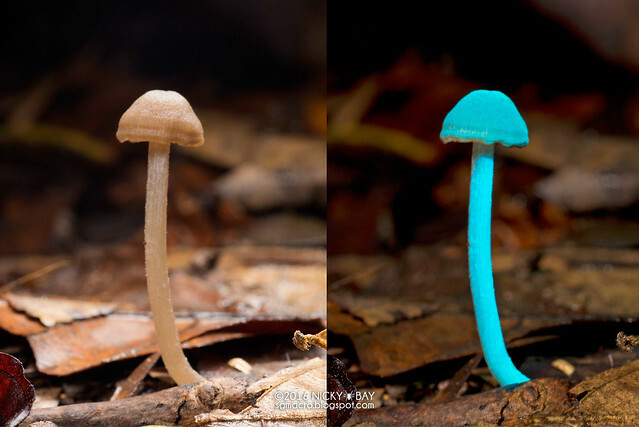 A recent discovery was an inconspicuous brown mushroom on the forest floor that fluoresced brightly under ultraviolet. 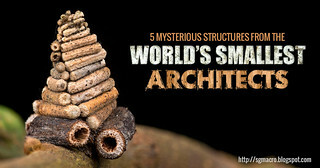 Not sure why, perhaps someone reading this would know? 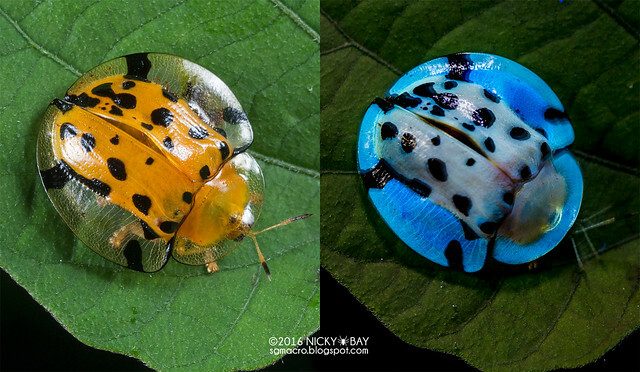 On its own, tortoise beetles are already mesmerisingly cute. Its elytra lights up well under ultraviolet! Under ultraviolet, this spotted flying stick displays a dazzling mix of colours. An otherwise boring looking "strawberry" turns into a blue gem! 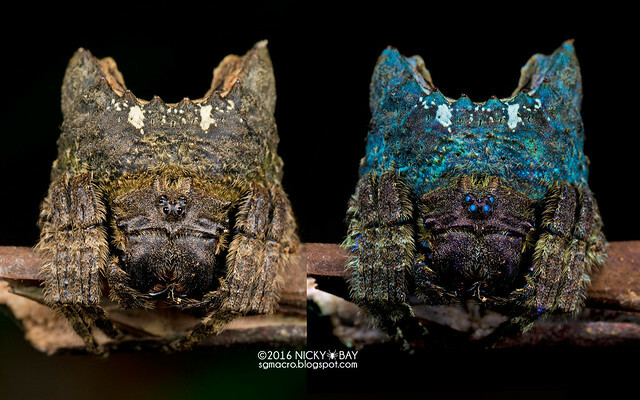 Enchanting fluorescence on this huntsman spider. So the biggest question that many may have, is WHY? 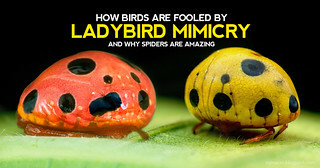 Why do certain species of arthropods fluoresce under ultraviolet? Is there a biological purpose? In 2013, Gwen Pearson had written an article based on some of my UV photos on WIRED, and DIYPhotography.net published a UV photo series from me in 2015. Other than these, articles and information on UV fluorescence and photography have been rare. Ultraviolet macro photography requires some skill, lots of luck, and a good amount of patience. 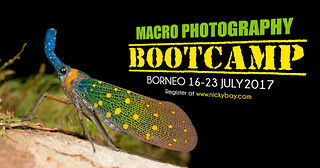 I've covered the technical aspects in detail in last year's Borneo Bootcamp and Bugshot Belize, and while I do not have advanced workshops planned for this year (yet!) 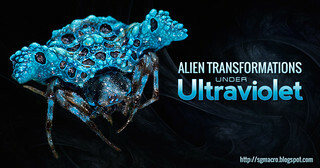 I hope to incorporate UV photography into the syllabus of all of my advanced macro workshops. Please share any other examples of UV fluorescence you may know of in the comments section below. 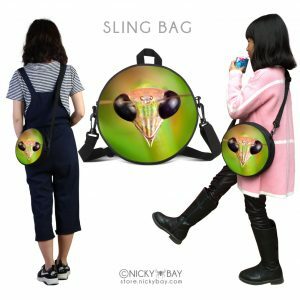 For queries, comment or mail me at nicky@bay.to. 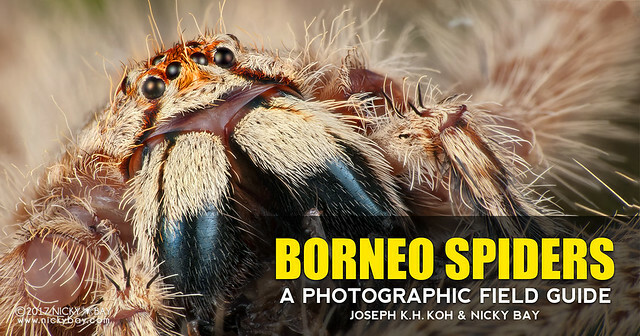 If you are interested in my other macro photography work, do check out some of my earlier photo articles below. 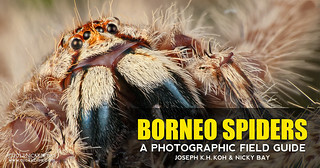 I also have an on-going Spider Photo Exhibition at the Senckenberg Natural History Museum in Frankfurt (Germany) until 7 January 2017, do pop by if you are around the region!